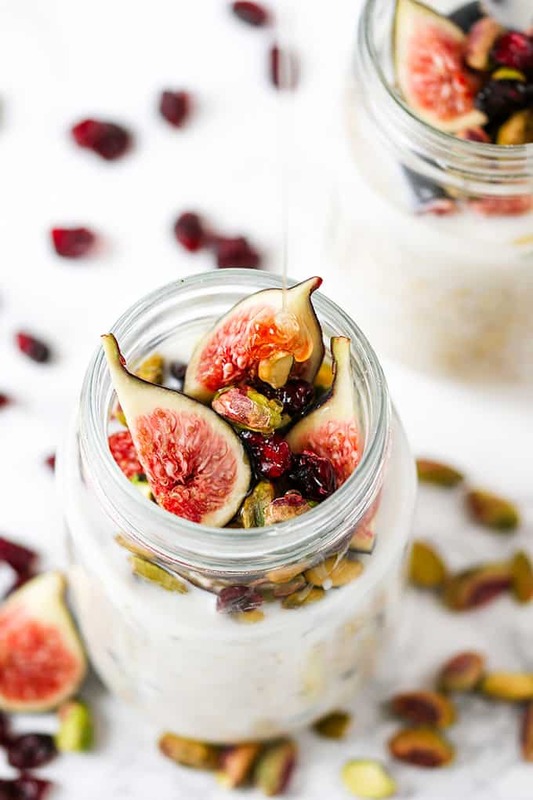 Overnight Oats with Figs and Pistachios – prep the night before so you can grab as you run out the door! Warm porridge (or oatmeal for my non-UK readers) is great for a staple breakfast, but have you every tried it cold? Not cooked and then left to cool. These oats are soaked overnight in milk so they’re ready to eat in the morning. 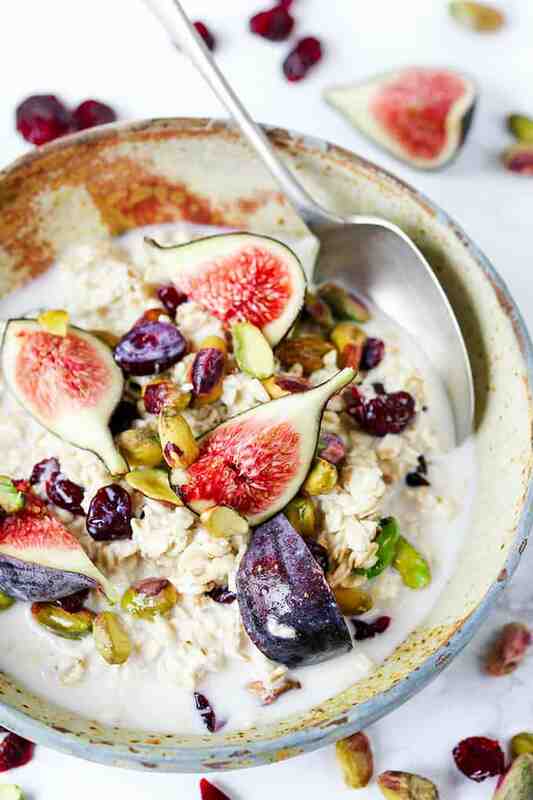 A hearty-yet-healthy meal you can make ahead – now that’s my kind of breakfast! 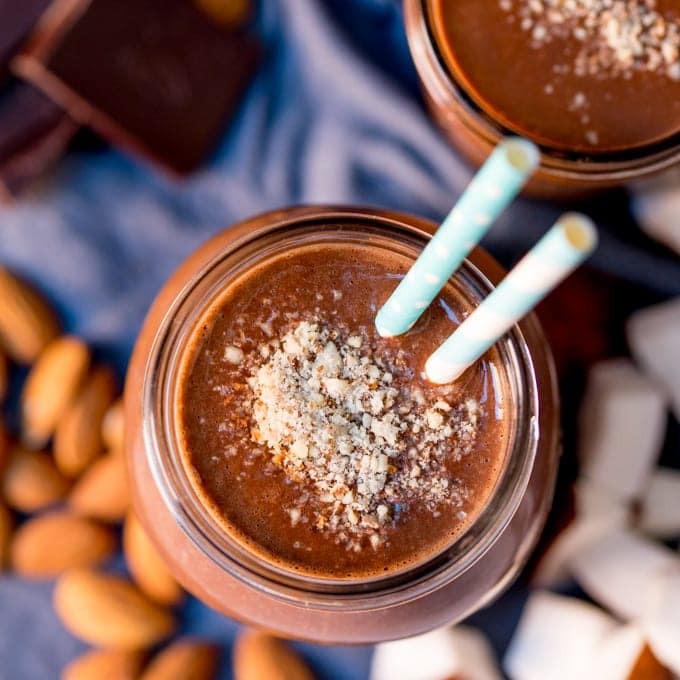 Use whatever milk you like – regular, coconut, almond – you could even go for chocolate milk if you want to indulge (no, that’s definitely not me, no – she says ignoring the last post of creme egg with cinnamon toast soldiers……). Soaking the oats overnight softens them, whilst still ensuring a bit of a bite. It also produces a quick, make-ahead breakfast with a beautifully creamy consistency. Mix and match the toppings depending on what you have in. 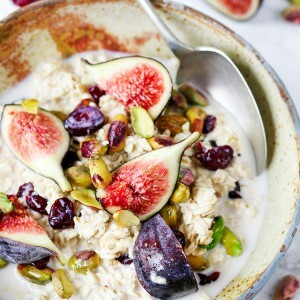 This Overnight Oats with Figs and Pistachios dish makes a perfect breakfast to grab from the fridge and take to work! 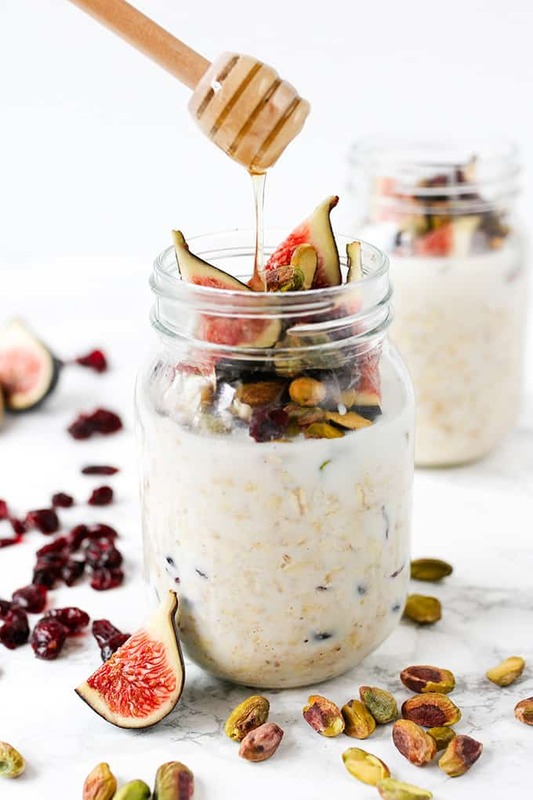 Overnight Oats with Figs and Pistachios - prep the night before so you can grab as you run out the door! 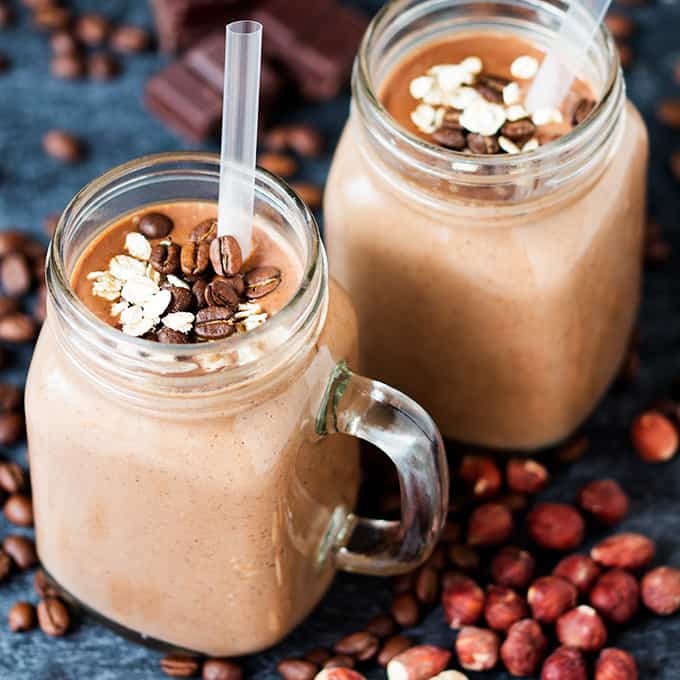 240 ml milk - this can be regular milk, almond milk or whatever your favourite milk is! Slice the figs into wedges. 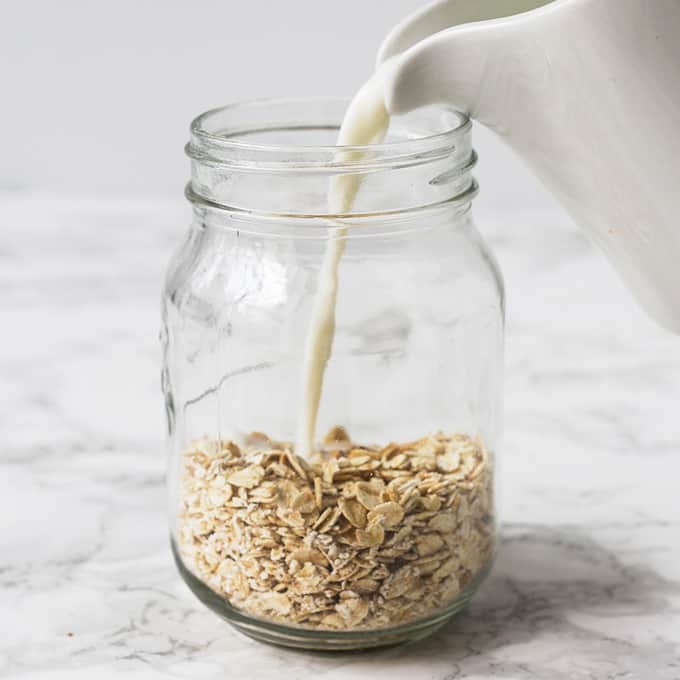 Divide the oats between two mason jars. Add the vanilla extract and then pour in the milk. Add the cinnamon and half of the cranberries, then give everything a stir. Place lids on the mason jars and refrigerate overnight (or for at least 4 hours). *Note - you can put the rest of the ingredients in at this point if you wish - however the pistachios will soften if left in the mixture for too long. 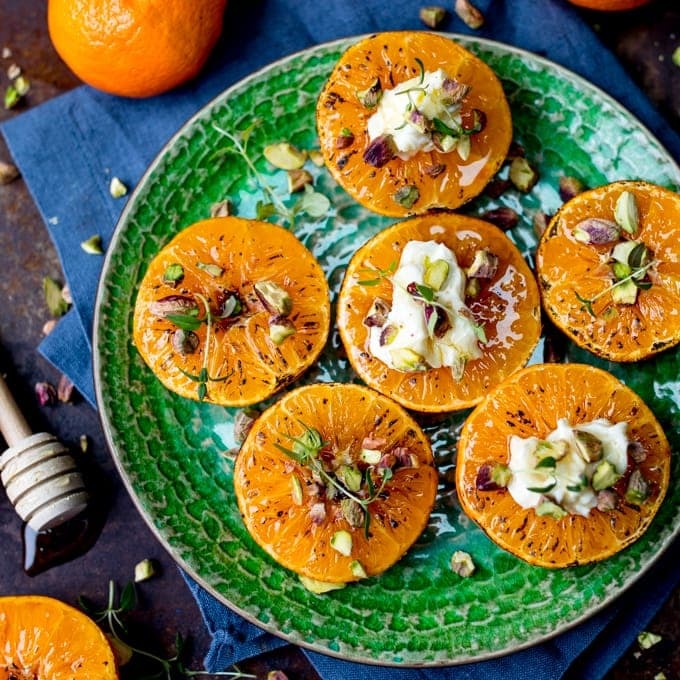 When you're ready to eat, take out of the refrigerator and top with the figs, pistachios and the remaining cranberries. Drizzle with a little honey, then serve. Eat straight from the jar, or pour out the contents into a bowl. Nutritional Information is per Serving, using Almond Milk. 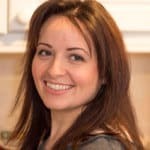 FYI – I first made this recipe for DIYs.com – check out the site for fab craft and food ideas! 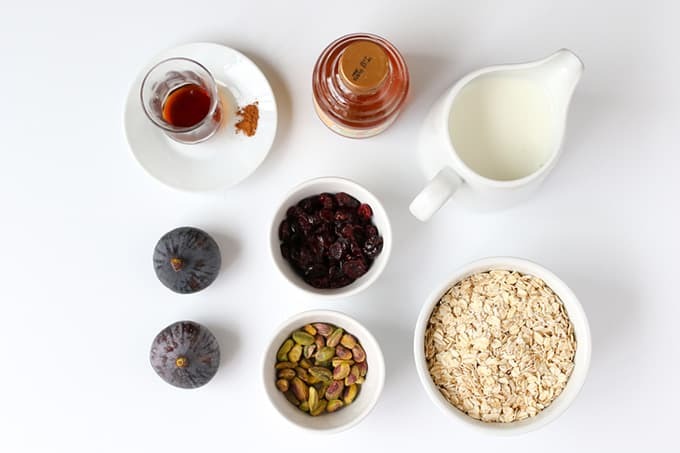 My favourite toppings for porridge or oats, love this. 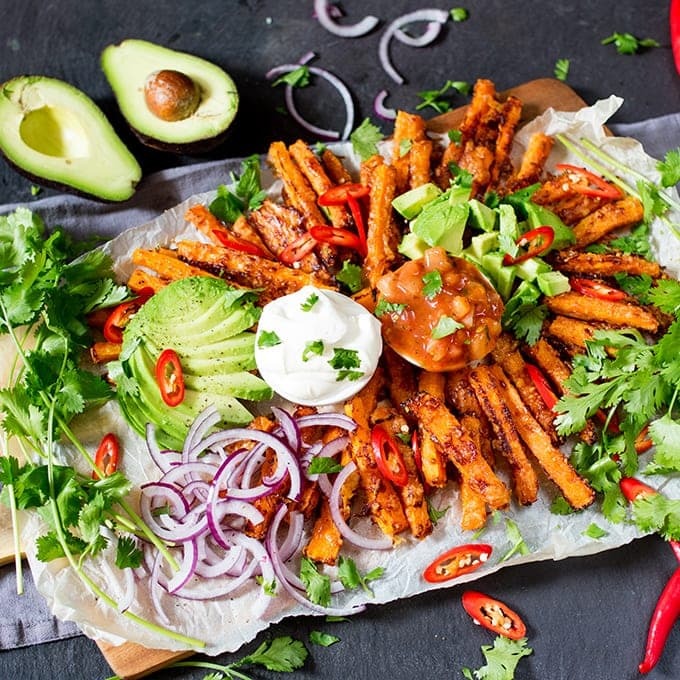 That is just gorgeous and delicious looking!